The Union Pacific Rolling Mill was constructed in 1875 to “re-roll” old railroad rails and other metals. 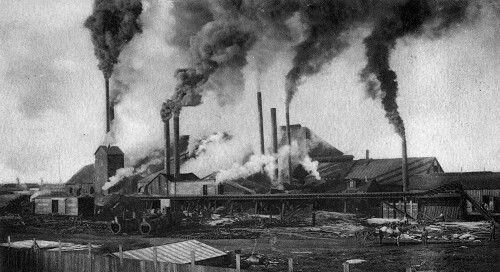 The mill employed approximately 100 people, and its presence might have been the springboard for further industrial development in Albany County until it burned down in 1910. The Boomerang reported that a spark from a westbound locomotive caused the fire, while the Republican indicated that the fire started in one of the stacks. Within minutes, the building’s roof collapsed. The first fireplug the hose company connected to was dry. By the time a connection was made to another plug, the fire was hopelessly out of control. Learn more about the Rolling Mill, the fire that destroyed it and the building of the Union Pacific Railroad in Wyoming.